The currently known active asteroids are 133P/Elst-Pizarro (see also) 176P/LINEAR |||| 238P/Read |||| 259P/2008 R1 (Garradd) |||| 324P/2010 R2 (La Sagra) |||| P/2010 A2 (LINEAR) |||| 596 Scheila |||| 288P/300163 |||| 331P/2012 F5 (Gibbs) |||| P/2012 T1 (see also this) |||| (1) Ceres |||| 311P/2013 P5 (see also Paper 2) |||| P/2013 R3 |||| 313P/2014 S4 (Gibbs) |||| (62412) 2000 SY178 |||| P/2015 X6 |||| P/2016 G1 and P/2016 J1. |||| In addition, 3200 Phaethon, 2201 Oljato and 107P/Wilson-Harrington are dynamically asteroidal bodies (Tisserand > 3) in which mass loss has been reported, but they are not in the main belt (one reason "Active Asteroid" is a better term than the previously used "Main Belt Comet"). The distribution of the mass-losing asteroids is shown below, including their relation to the asteroids (orange dots) and classical comets (blue dots). updated from Jewitt 2012, Astron. J.. (Click graph for a full size version). The prototype was discovered as asteroid 1979 OW7, rediscovered as asteroid 1996 N2 and then found to be a comet by Eric Elst and Guido Pizarro in 1996. It is now given a cometary designation as 133P/Elst-Pizarro. For some years, the nature of this object was misunderstood. It was first believed to be the signature of the unlikely impact between two asteroids. But 133P has flared into activity on three successive perihelion passages. This substantially discredits the asteroid impact model (because one impact would be unusual enough, three on the same object would be unusual-cubed). We suggested that 133P has an intrinsic source. As other examples of dynamical asteroids with mass-loss were found, the objects were recognized as a new category in 2006 (Hsieh and Jewitt 2006, Science, 312, 561-563, here as a pdf). Activity in 133P/Elst-Pizarro is recurrent, having been observed at each of the last three perihelia. This is inconsistent with an impact origin but exactly what we would expect from a thermal process such as sublimation. It is what we see in the classical comets, for example, where the driver is the sublimation of water ice. While impacts cannot reasonably explain a repeatedly active body like 133P, I believe that impacts may provide the trigger needed to initiate the activity in some bodies. I made a sketch of this impact trigger mechanism . 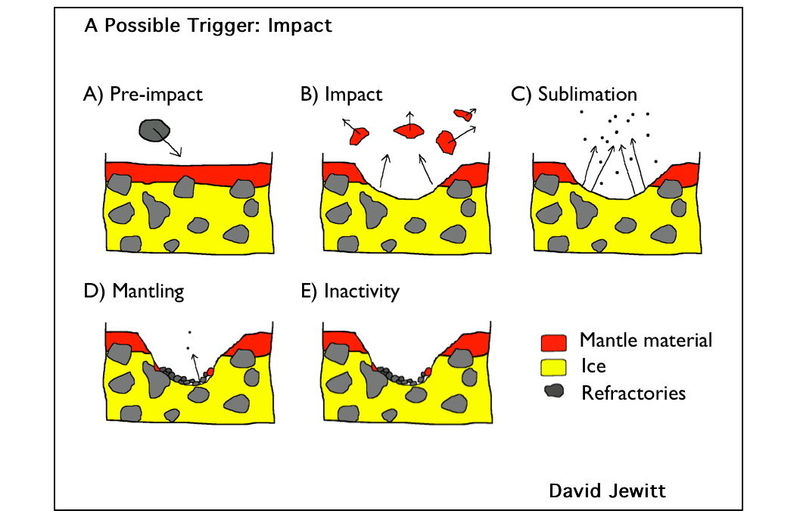 Impact is the explanation many people reflexively jump towards when thinking about the Active Asteroids. In fact, though, observable impacts are quite rare, essentially because 'space is big'. The best case is for Scheila, in the sense that no other interpretations fit the data. 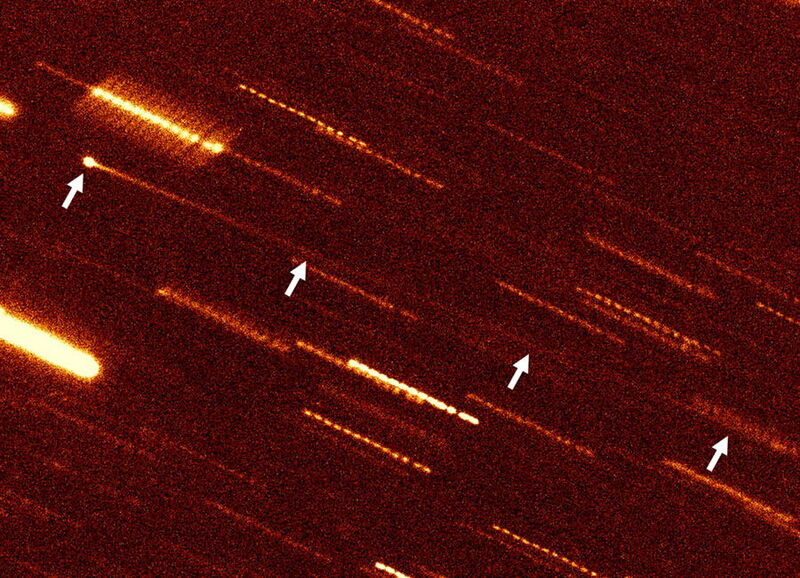 Another candidate is P/2010 A2, in which the strange morphology (unlike that of other comets) is consistent with impulsive formation in 2009, nearly a year before the object was discovered. It is also possible that rotational bursting (see below) is behind the appearance of P/2010 A2. I think that such events (disruptions producing A2-like objects) occur annually or perhaps a little more frequently. On the Moon, dust is levitated by electrostatic charge gradients caused by uneven solar illumination (sunlit regions lose photoelectrons which fly away and stick in the shadowed regions). With the much lower gravity on km sized asteroids, dust could be electrostatically ejected from the body. We cannot rule this process out - however, it is hard to see why it would not apply to all small asteroids, whereas our observations show that activity is rare. Furthermore, (596) Scheila is too large (110 km diameter) for electrostatics to launch dust. A rapidly rotating asteroid could lose mass centripetally. 133P is indeed quite a rapid rotator (the period is about 4 hrs) but there are many faster rotators that do not lose mass and other active asteroids lose mass but do not rotate quickly (e.g. 176P has a period near 20 hr). It is further difficult to see why rotation would eject dust from 133P only when near perihelion: if it's unstable it should be unstable all the time. As noted above, our measurements of P/2010 A2 are consistent with a rotational disruption, perhaps caused by radiation torques. The best cases for rotational instabilities are probably those of 311P/2013 P5 (see also Paper 2 ) which we interpret as a mass-shedding asteroid (one in which the loose surface material slips off) and P/2013 R3, whose entire body was disrupted. Caption: Image of main-belt comet 133P/Elst-Pizarro from the 2.2-meter University of Hawaii telescope on Mauna Kea taken UT 2002 September 7. The long trail of dust particles crosses the image from upper left to lower right. "String-of-sausages" objects in the image are field stars and galaxies smeared-out by tracking the telescope to follow the non-sidereal motion of 133P and chopped up by recording the image in many small pieces. Click on the image for a larger version. From Hsieh et al (2004). Thermal effects are capable of producing and launch dust grains on strongly heated asteroid surfaces. Thermal fracture occurs when expansion stresses exceed the tensile strength of the material. Hydrated minerals (clays, serpentine etc) can lose trapped water when heated, causing fracturing and dessication as seen in the cracked mud of a sun-baked lake. Such effects may be responsible for the mass loss found in 3200 Phaethon when near perihelion (q = 0.14 AU, where peak surface temperatures may approach 1000 K). Dehydration can also occur through impact shock compression. Radiation pressure competes with gravity to sweep unattached particles from the surfaces of asteroids. Near the sun, radiation pressure can eject dust very readily from km sized bodies and it can work in tandem with the other processes to leak material from the asteroids. Papers describing these mechanisms are linked here and here. The significance of the activity is that at least some appear to be a distinct, third comet reservoir in the Solar system (after the Oort cloud and the Kuiper belt). There is no established dynamical pathway between these other reservoirs and the main-belt in the modern solar system, so any ice probably has led a different history from ice in the other comets. 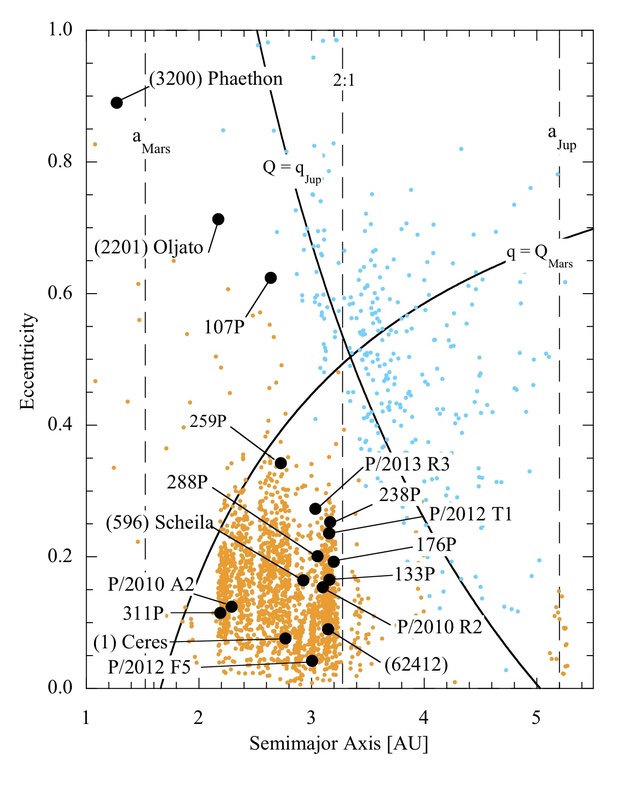 Comparing objects from the three reservoirs allows us to sample the protoplanetary disk of the Sun at three locations (the asteroid belt - near 3 AU and formation temperature near 150 K, Oort Cloud comets - 5 to 30 AU formation temperatures 100 to about 50 K; Kuiper belt - beyond 30 AU, 50 K and colder). Active Asteroids may illuminate the sources of the terrestrial planet volatiles, including the origin of the Earth's oceans. If Earth formed hot, consistent with its large size and gravitational potential, then water and other volatiles might have been added later, after the surface had cooled down. 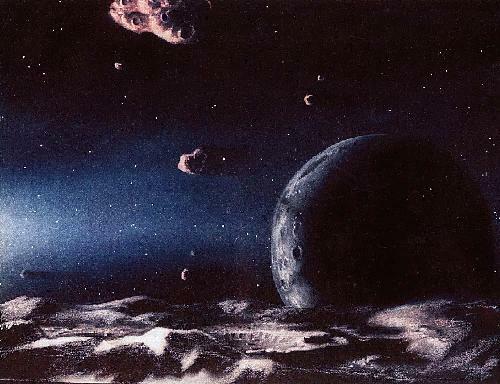 The outer asteroid belt - home of many active asteroids - is a leading candidate source region for this so-called "late veneer" of added volatiles. Many carbonaceous meteorites (e.g. the CM chondrites) contain hydrated minerals like serpentine, carbonates and even grains of salt have been found. The parents of these meteorites must have contained liquid water. The active asteroids may be closely related to these hydrated bodies, except that the ice survived because the temperatures never reached melting. Perhaps the active objects are pieces of the icy crusts of parent asteroids whose interiors were more thoroughly cooked by embedded short-lived radioactive nuclei.